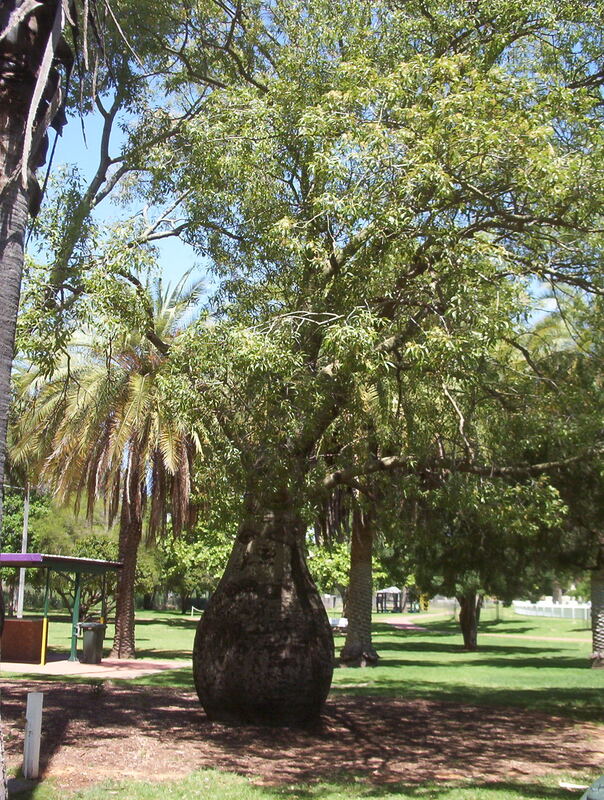 I found this unusual tree in a park in Nerrandera. It grows to a height of 10-20 metresÂ and a width of 5-15m. It has yellow belll flowers in clusters, each flower about 5 cm long, in Spring and Summer. It grows in full or part sun, in acidic to mildly alkaline sand loam or clay, and tolerates some dryness. It is suitable hills areas and inland planting. The foliage can be partly deciduous, and stock will eat it. This plant is suitable for pots, parks and large gardens in favourable areas. As it is so slow growing, it would take many years to be a large tree. More information can be found here. This plant has been used by Aboriginal people as bush tucker. Warning: the seed pods of Brachychiton rupestris (Bottle Tree) have irritating hairs. Foliage, roots and seeds are edible, however seeds must be roasted. Another warning! Be sure of the identity of all bush tucker plants before eating!